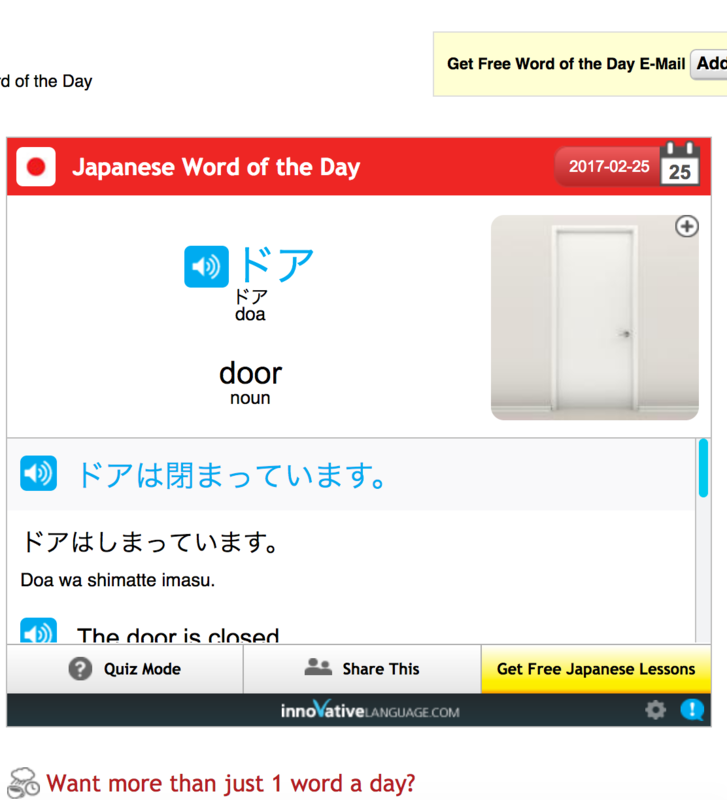 January 11, 2016 by The Junkie 0 comments on "Why ALL Learners NEED a Japanese Word of the Day Email"
If you’re learning Japanese, or want to start, getting the Japanese Word of the Day email is the best and easiest way to start. You learn JUST ONE new word a day, every day; it’s that simple yet so incredibly powerful. In fact, “smart learners” make the stupid mistake of not learning with the word of the day. Why? They think “1 measly word a day” isn’t enough. You’re probably thinking that too. Learning a word a day won’t change your life, right? Here’s why learning 1 Japanese word a day is powerful. How long would it take you to open and read a Japanese word of the day email? And learn a new word? Under a minute. The meaning is given to you. All you have to do is open it, read it and remember it. Even if you’re busy. Even if you don’t have the time for longer Japanese lessons. With this, you can always find time for 1 measly word. 2) Things that are easy to do are EASY to continue. You don’t quit. Do you know why Japanese learners fail? They focus on BIG, AMBITIOUS goals that are HARD and take time to achieve. Then they quit because… it’s too hard. Failures set BIG, HARD “FLUENCY” goals and don’t know how to reach them. The end. 3) It adds Up. Your progress adds up in the long run. One Japanese word of the day email now. Another one tomorrow. Another one the day after. Soon you know 7 new words in a week and you spent under a minute on them all. In a month, you learn 30-31 words. It still sounds small right? But consider the time investment. Consider the fact that tons of learners DON’T remember the 30 words they learned this past month. So, it’s easy Japanese progress. But, there’s more. 4) You learn persistence, consistency & develop habits for success. Everyone can start learning Japanese. Few continue learning and most give up. Why? They don’t have the habit of being consistent. And no-one is born with the habit of consistency. We build it up by doing things every day. And the easiest way to do something daily… is to do something easy. Again, this is where the Japanese word of the day comes in. 5) Because it’s easy, because you succeed… you realize you can DO MORE. You realize… “alright, learning 1 word a day is easy – I’ve been doing it for a month. I think i can do even more. NO, i Want more!” So you get frustrated by slow progress. That’s GOOD! You realize you can learn more. You think you learn 10 words a day now. Maybe you buy a textbook or an online course. Why? You gain confidence. If you can learn 1 word, you can surely learn a lot more. And this is where success comes. By now, you’ve developed the habit of consistency and gained some confidence. You can do more and you want to learn more. This is how a little learning tool like a Japanese word of the day email can take you far. Sure, you can intellectually understand that you’ll get frustrated by learning 1 word a day. That’s what “smart learners” typically say. Just like I understand that going to the gym is healthy…. but I don’t. And they don’t learn either. 6) They come daily. They keep you going. You don’t need to think about it. The email comes and you learn a word. If you’re low on motivation, the word comes to you anyway. There are very few things in life that will stick with you. The hobbies you gave up on. The friends you had in high school. And it’s easy to give up. The Japanese word of the day email keeps on coming and keeps you going. This is one guarantee. As far as I know, JapanesePod101 provides this useful learning feature for free. This is how I started learning Japanese slowly but surely – with the daily words. Just click here to visit JapanesePod101.com and sign up. If you’re interested, you can check out their lessons – but here, we’re only talking about the word of the day. Enter your email and select your learning level as seen in the picture below. You can always unsubscribe anyway. And every day, you’ll learn a new Japanese word. As you can see in the image below, each word comes with the meanings, romanizations, sentences and audio to hear the pronunciation. Starting with small and simple steps is how i started learning Japanese. It’s how I kept going. And it’s how I’m still learning today, without quitting. Of course, my goals have grown from “1 word a day” to reading Japanese articles and taking JapanesePod101 lessons but the point remains. Learning 1 Japanese word a day, everyday, can help you set successful habits and reach fluency. So be sure to start small. Start learning 1 Japanese word a day. Or perhaps, try something else that’s small and easy. Read one Japanese sentence a day, every day. It’s up to you. Click here to get the Japanese word of the day email. And let me know if you do something on a daily basis. Previous Previous post: The Complete Duolingo App Review: Does it WORK?